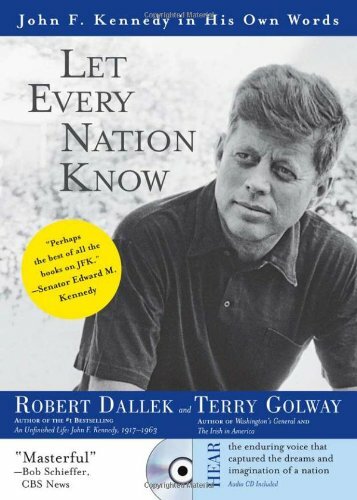 Let Every Nation Know is the first book of its kind-a historical biography in Kennedy's own words. Combining a remarkable audio CD of Kennedy's most famous speeches, debates and press conferences with the insights of two of America's preeminent historians, the result is a unique look at the world-changing words and presidency of John F. Kennedy. Robert Dallek, author of the #1 bestselling biography An Unfinished Life, and Terry Golway, author of Washington's General, bring to life the soaring oratory, marvelous wit and the intense drama of Kennedy's words and the events they evoke. If you have any questions about this product by Brand: Sourcebooks MediaFusion, contact us by completing and submitting the form below. If you are looking for a specif part number, please include it with your message.